Everyone knows that a balanced diet plays a vital role in promoting good health. Eating better can help you maintain excess body weight, combat disease, boost your energy, and it can slow the process of aging. When combined with daily exercise, the benefits of a balanced diet can help us feel better and live longer. Proper nutrition is even good for your mind, too. It can reduce stress and improve mood by increasing blood flow to your brain. You may be thinking to yourself, “This seems great, but I don’t know how to eat a balanced diet.” That’s okay. Most people don’t. The first step in eating a healthier diet is education—you have to understand what you’re actually eating so you can balance out the right amount of carbohydrates, proteins, and fats. 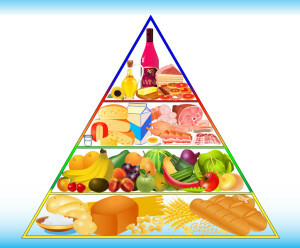 A balanced diet means eating the right proportion of fruits, veggies, whole grains, low-fat dairy foods, and meats. In short, you should eat from all basic food groups every day (remember the food pyramid from elementary school?). Eating a balanced diet also means limiting foods that contain fats, sodium, and sugar (i.e. top of the pyramid). It’s important to note that eating healthy is not the same as dieting, and it doesn’t mean you have to starve yourself. A diet is a temporary change to your daily consumption habits whereas healthy eating means eating a balanced diet for life. And starving yourself is never a good idea if you’re trying to lose weight. This can actually cause your body to store more fat to compensate for the lack of nourishment. Once you’ve determined what to eat in order to hit all the major food groups, the next thing you have to know is how much. That’s when you have to start tracking calories. Calories are simply a measurement of energy and it’s an important part of eating a balanced diet. Food provides energy—some more than others—and calories help us gauge how much energy we should get when we consume something. As required by the Food and Drug Administration (FDA), you can find the number of calories per serving for most items you consume by looking at the nutrition label. Your doctor can tell you what your proper calorie intake should be, but you can use this tool to get an idea of how many calories you should eat if you want to lose, maintain, or gain weight. And tracking them is even easier thanks to mobile apps such as “Calorie Counter & Diet Tracker” by MyFitenessPal and LiveStrong’s “MyPlate” calorie counter. Eating a balanced diet takes determination, planning, and persistence—and it should always be supplemented with daily exercise. Consuming more calories than you burn off can lead to weight gain, so it’s a good idea to follow an exercise plan in addition to a balanced diet, especially during the holidays. 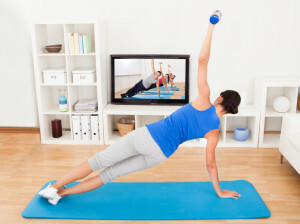 This can be moderate aerobic activity or vigorous strength training, depending on your fitness goals. At a minimum, the Mayo Clinic recommends 30 minutes of physical activity a day for optimal health. How can you do this with a busy schedule? You could go for a walk during your lunch break, take the stairs instead of the elevator, or you could ride a bike instead of driving your car. The options are endless, but the key is to maintain a balanced diet AND regular exercise, not one or the other.